Sometimes its the little things that make you smile. 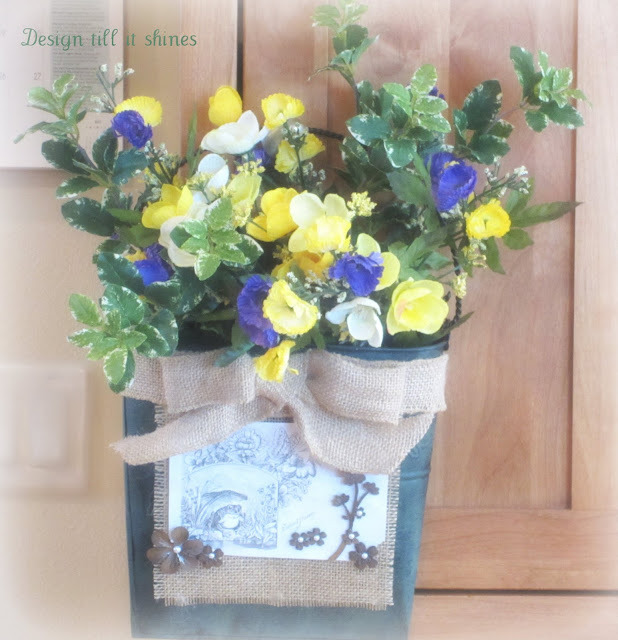 I was trying to come up with a way to decorate my metal basket with burlap and add my metal flowers, but I couldn't find a graphic that would work. Then I found this sweet frog in a garden graphic at the Graphics Fairy and decided to use it. I thought the frog graphic looked almost magical so I thought I'd combine it with my burlap for a different look. This is the same basket I used for St. Paddy's day. I always like to reuse things I make as much as I can because as I've mentioned before my storage space is limited. Along with my creative abilities at times! Although it's hard to read, the words on the graphic say Sweet Home. 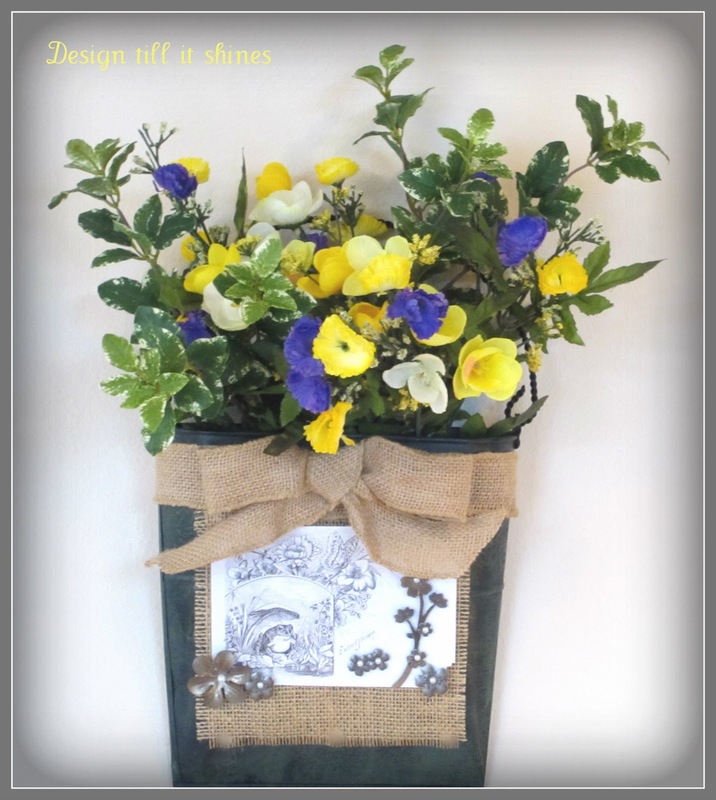 I love yellow and purple flowers together this time of year so I added those to some greenery. I added a piece of burlap for the front and some burlap ribbon for a bow. I wanted to use my metal flowers so I added some pearl dots to the centers. I'll change this graphic when I find something that goes better with the flowers and burlap, but for now I'm enjoying the frog in the garden. I also wanted to share a few of my thrifty finds. 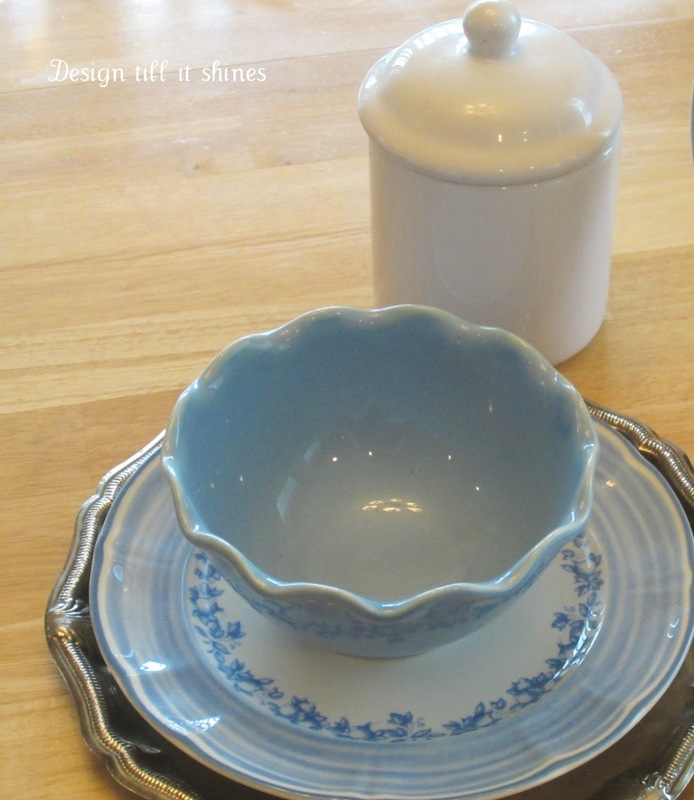 I love the little blue bowl with the scalloped edges and found these plates nearby at one of my favorite thrift stores. 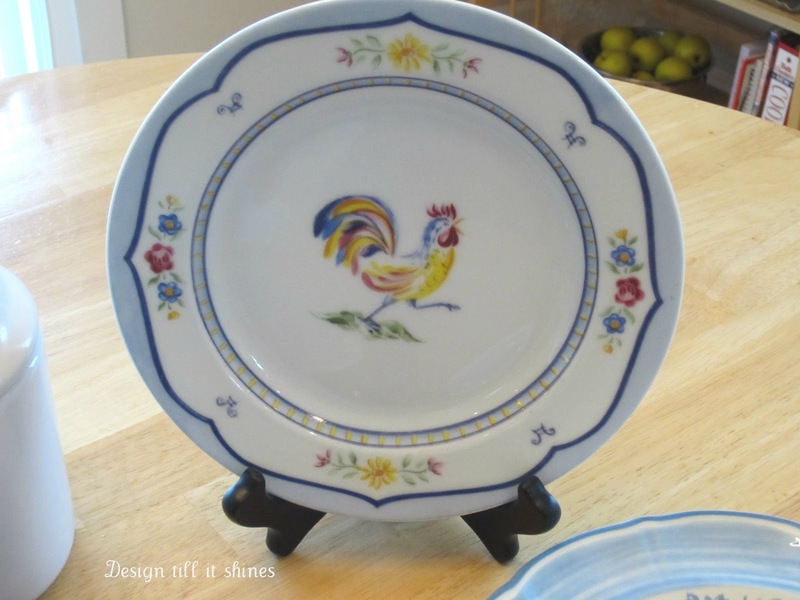 The rooster plate has such pretty colors and it definitely has that frenchy farmhouse look. It goes well with my little bowl and plates. I like the little farmhouse style ceramic container and the metal tray too. I'm looking forward to creating a vignette with some of these spring finds that brighten my day. I've also added a tab at the top with scenery of the Pacific NW or you can check here. Your basket is beautiful and so unique! I appreciate the nice comment. Thanks for stopping by! What a pretty door basket!! Lovin' your charming basket...thanks so much for sharing it at my party. 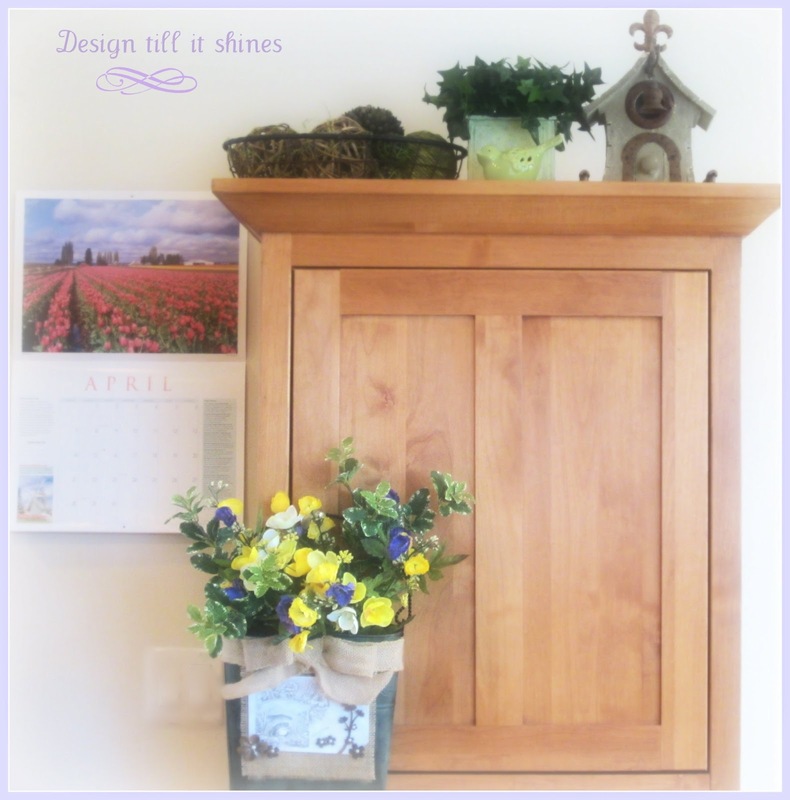 Love the door basket and the whole vignette.It just makes one smile. The frog on your basket is cute. And I love the dishes you found. Love your door basket. So pretty and the frog is so cute and those flowers are so springy. Great thrifty finds too. So great to see you and thanks for stopping by. Have a nice evening. Looks adorable! 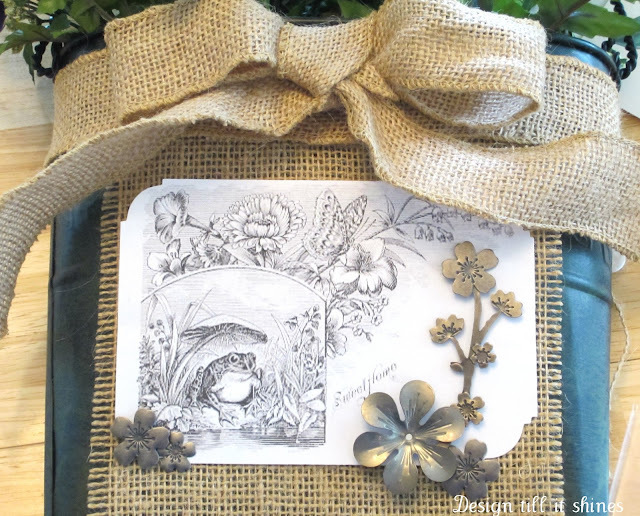 I think the frog works well with the burlap and flowers. 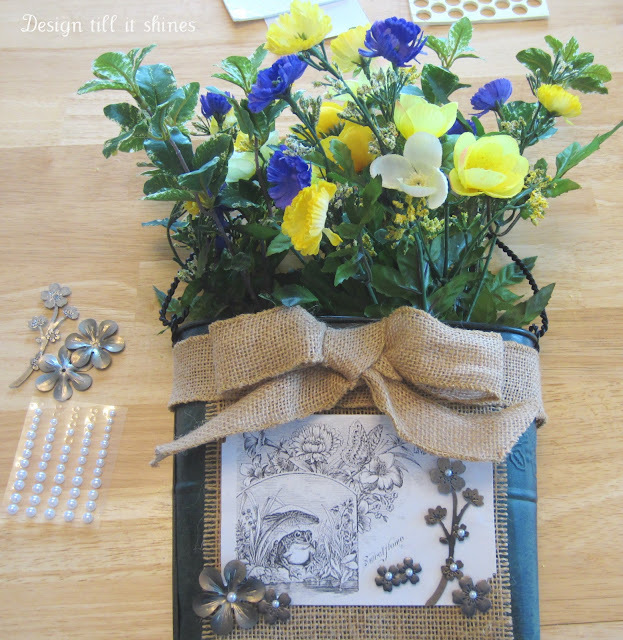 Thanks for linking up at A New Creation and for following me. So glad to have you join! Really like the burlap and tin. Glad I found you on Share Your Cup Thursday! your basket with the flowers and burlap is so cute, the frog goes right along with your spring theme. 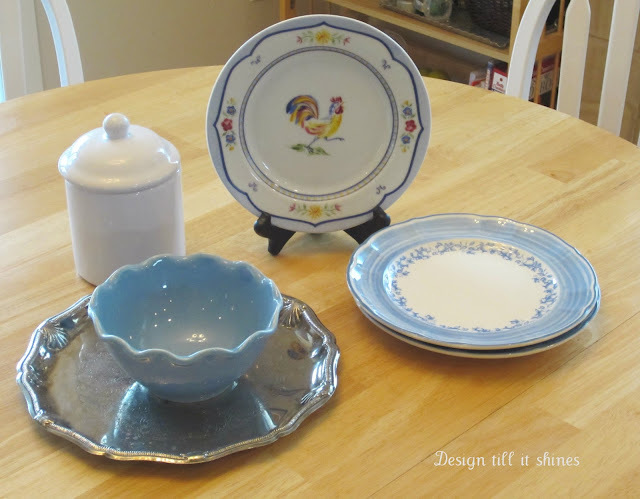 You found some really cool dishes, thrifty finds are the best! So glad to hear from another "Johnny" lover! It was fun looking back and remembering! 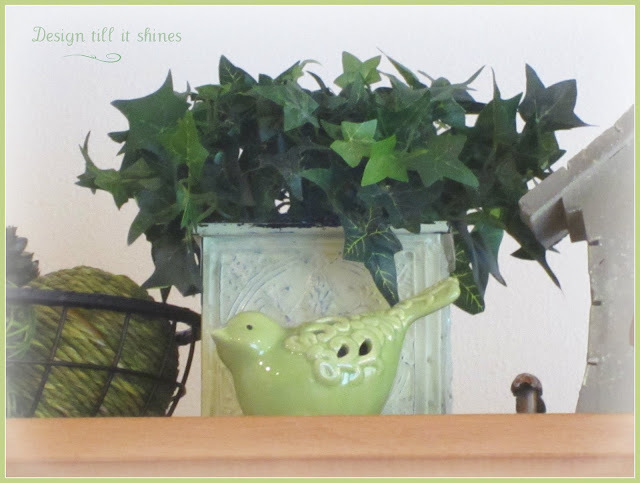 Diane - Your Spring vignette is so pretty. Looks so refreshing! Neat finds. Am coming over from Brenda's Cozy Little House. Your basket looks so adorable!! Welcome!! I love your basket so cute and fresh. Perfect for Spring. Thanks so much for joining us this week at Transformed Tuesday. I hardly ever find nice plates at the thrift store. Great finds! love that metal basket too. It looks totally different with the fun stuff you added to it! Diane, I really like the little frog. It looks so cute with the burlap and metal flowers. Really enjoyed seeing all of your fun finds too. Thanks for sharing with SYC.